Soccerclub | Sports Club WordPress Theme is a creative, clean & modern multi-page and multi purpose template made especially for soccer sports club. The well-written code makes you comfortable to redesign the theme. Well documented help file helps you modify and edit this theme according to your own wish. Theme dedicated to club football. Localization support for English (US), German, French, Spanish. Visual Composer Modules dedicated for the theme. Visual Composer [ Free Cost $34 ]. 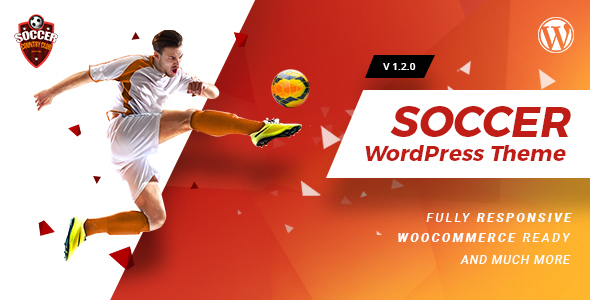 SoccerClub Visual Composer Addons [ Customized Visual Composer addons for theme ]. Whitelabel Admin Panel using Redux. Logo options for Header and Footer. Unlimited Footer widget options for 4 and 3 Column. Shop Settings with Catalog Mode. CMB2 Metaboxes For Page Settings. Page Specific Header with 7 different Header styles. Light, Dark [ With Unlimited Color Options ] and Transparent Header Options. Footer Options with Unlimited background color. Page Banner and Introduction area. We will provide free demo installation support for first 50 customers (request along with the purchase token). 1. Magazine Demo layout provided along with the demo files. 2. Improved IBT Widgets template ( Recent Posts ). 3. Improved code in Soccerclub_VC_Extensions plugin to cache data for faster loading API results.